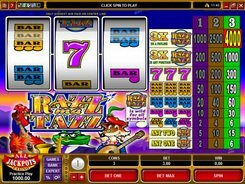 Microgaming’s developed Grand 7’s is a purely classical Vegas-style slot machine with three loose reels and a single payline. 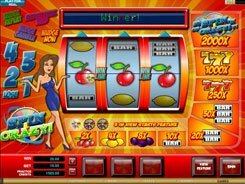 The game is designed to look and feel like an authentic brick and mortar one-arm bandit, with no bells and whistles typical of modern five-reel machines. 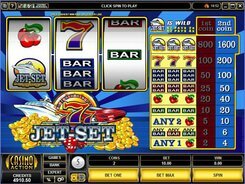 The symbols set incorporates cherries, bars, red sevens and blue sevens. 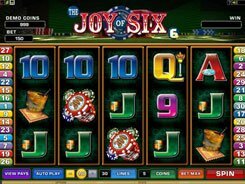 Before every spin, you can adjust the number of coins per line (up to 3) and set a con size from $0.25 to $5. From that, the floor and ceiling bets amount to $0.25 and $15. Bars and sevens can make mixed combos, e.g., one red 7 and two blue 7’s, or one double bar and two triple bars. 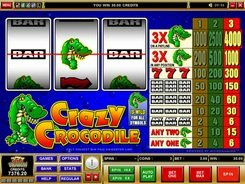 Mixed combinations pay out x5 to x120 times a bet. The largest payer in the game is the Red 7 symbol that awards a top jackpot worth x2500 for three of a kind. 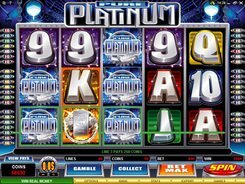 To qualify for the top prize, you should bet three coins per line, per spin, otherwise the payout will be x500 or x1000. 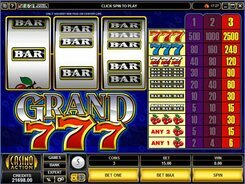 In conclusion, Grand 7’s is a genuine Vegas-style slot without any modern features such as wilds, scatters and bonus rounds, but still providing some fairly good payouts.